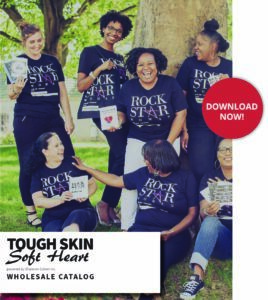 If you are interested in becoming an authorized retailer of Tough Skin, Soft Heart products powered by Shannon Cohen, Inc., please fill out the form below. We look forward to partnering with you to give your customers the Shannon Cohen experience! • Payment can be made by pre-paid check or credit card. Wholesale pricing information will be provided once the wholesale retailer application process is completed and approved. Our normal turnaround time is 5-7 business days, however, turnaround times may vary. Shipping costs will be included on the final invoice. Please notify us of any time-sensitive orders. Expedited shipping is available at an additional cost.